Yes Dental Centers (Los Angeles) - Book Appointment Online! Whether you're looking to improve or enhance your smile or you want to restore your ability to chew better look no further. 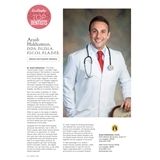 Our award winning dentist, Dr. Arash Hakhamian, was voted one of the top 40 dentists under 40 in the Unites States in addition to being voted one of the top Cosmetic Dentists in Los Angeles July 2018 by LA Magazine. We have 11 specialists and affordable payment plans available. We accept all PPO insurances and have discounted plans for non insured patients. Set up you complimentary appointment to come in and meet our award winning team.